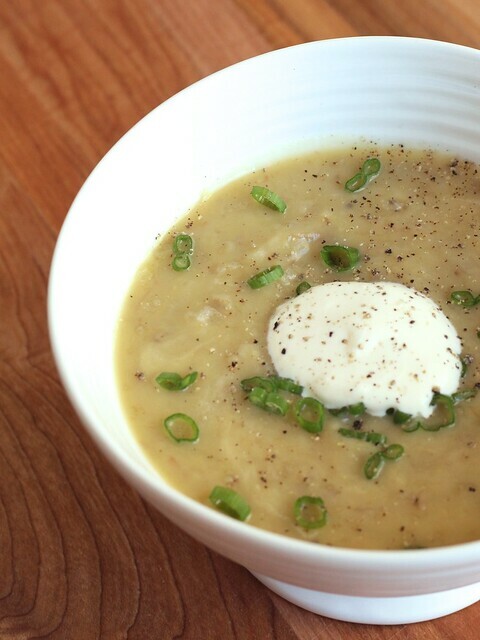 This roasted potato-leek soup is a terrific way to warm up on a cold winter night. With minimal prep and a streamlined ingredient list, you’ll love how quick, easy and budget-friendly it is to prepare! Preheat oven to 450°F. Toss potatoes with 1 tablespoon of the olive oil, transfer to a roasting pan or parchment-lined baking sheet. Coat leeks with remaining tablespoon oil, separating leeks into individual layers. Arrange leeks over potatoes, season with salt and pepper. Place pan in preheated oven; roast for 20 minutes, toss mixture and roast until potatoes are cooked and golden brown in spots (about 20 minutes more). Transfer roasted veggie mixture to a food processor or blender, add chicken stock and blend until desired texture is reached (you may need to do this in batches, depending on the size of your blender/processor). Pour blended mixture into a medium pot (4-quart), set over medium heat and cook, stirring occasionally, until hot. Season to taste with additional salt and pepper. Serve immediately topped with a dollop of crème fraîche and chives, if desired.